I have to confess... I only read this book after seeing the movie trailer. I was intrigued to say the least, so I just had to read the book. I am one of those people that have to read the book before seeing the movie. This book was no different. I'm not sure what I expected after seeing the trailer, but I can say that this book was a lot different than what I perceived it as. I was expecting Clary to be grabbed up and told she was different... I mean that is what the trailer shows right? I mean with the glowing hand and all there is something definitely different there. But, I was kind of disappointed. Instead of a book packed full of action and a story full of Clary, I got a book packed too full of action and not that much about Clary. There were times that I was bored with the storyline and there were other times where I loved it. I loved the budding relationship between Clary and Jace. Clary was a bit... flat. But, I did feel that she came into her own by the end of the story. I did feel kind of bad for her bestfriend and they way she was stringing him along. There's only so much a best friend should have to go through. I was loving this book... and then BAM. The ending revelation... Seriously? I wanted to throw my kindle across the room. NO NO NO. And.... ewwww. Cassandra Clare... you are killing me! Seriously why did you have to go and do that to me? Thankfully, I had google and I found out that the ending isn't true. Thank goodness! (I cheated, sue me) I just couldn't go on with that ending. Sorry. Overall, I would recommend this book to my friends and to anyone that loves young adult action/paranormal/romance books. But, if you read it and don't take the easy way out and look up the rest of the books, I will forewarn you. You WILL hate the ending! The story does have a bit of dull story plots, and some flat moments, but overall I loved it. I vote for Clockwork Angel. 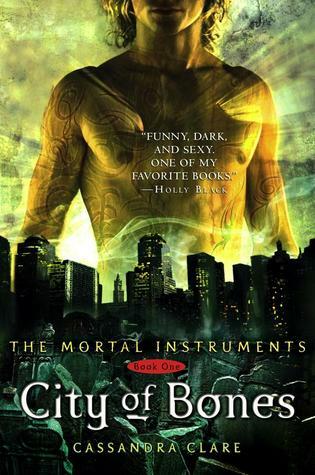 I don't know if you'll want to go past book 3 though for The Mortal Instruments. My advice- wait until the last book is released listen to the reviews and if they're negative pretend the books end at 3. You'll be happier that way. I have heard that the books after three aren't necessary. I think I will take your advice on this one!